This Quick Start builds a data lake environment on the Amazon Web Services (AWS) Cloud by deploying Talend Big Data Platform components and AWS services such as Amazon EMR, Amazon Redshift, Amazon Simple Storage Service (Amazon S3), and Amazon Relational Database Service (Amazon RDS). The Quick Start is for users who are evaluating big data in the cloud or looking to accelerate their big data initiative through the adoption of best practices for big data integration. 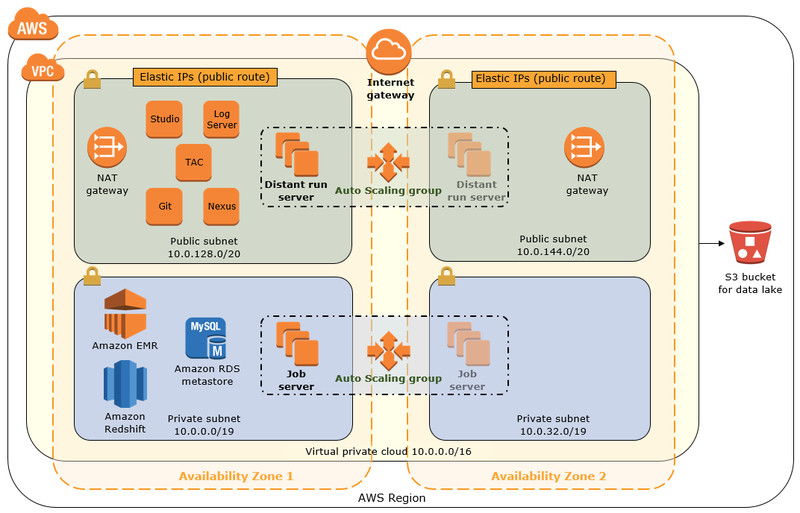 You can choose to build a new virtual private cloud (VPC) infrastructure that’s configured for security, scalability, and high availability, or use your existing VPC infrastructure for the data lake. Talend public servers that host the Talend Administration Center (TAC) for administering Talend jobs via the browser. A Talend Studio remote desktop instance available through an X2Go client for users who do not want to run Talend Studio on their laptops. A Nexus artifact repository and Git servers for binary and source configuration management. A Talend log server using Amazon Elasticsearch Service (Amazon ES), Logstash, and Kibana. An Amazon RDS MySQL DB instance to host Talend metadata. An Amazon EMR cluster with Pig, Hive, and Spark that integrates closely with the Talend Big Data Platform and provides Hadoop capability in the data lake. An Amazon Redshift cluster for use as a data warehouse or data mart. In the private subnets, Talend job server instances running Talend jobs scheduled by the TAC, in an Auto Scaling group. Auto Scaling allows EC2 instances to be automatically spun up or down to respond to the demand on the Talend job servers. You can configure the desired and maximum number of instances during deployment. In the public subnets, Talend distant run job server instances running Talend jobs on behalf of Talend Studio users, in an Auto Scaling group. You can run Talend jobs locally on Talend Studio or on these servers. The Auto Scaling group allows EC2 instances to be automatically spun up or down to respond to the demand on the Talend job servers. You can set the desired and maximum number of instances during deployment. Amazon S3 to ingest data for the data lake. Upload your Talend Big Data Platform license to a private S3 bucket. You can sign up for a 30-day free trial license on the Talend website. Test the deployment by opening the Talend Administration Center (TAC) and checking the servers deployed by the Quick Start. You can also run the optional Talend jobs to test end-to-end data integration, by following the steps in the user guide provided by Talend and Cognizant. The Quick Start includes parameters that you can customize. For example, you can configure your network or customize TAC, Amazon Redshift, Nexus, and Git server settings. You will need to provide your own Talend Big Data Platform license. To request a 30-day free trial license, please fill out the registration form on the Talend website. You’ll receive a unique license key from Talend, which you’ll use during the Quick Start deployment process. The code for all Talend jobs included in the Quick Start are released under the Apache License.